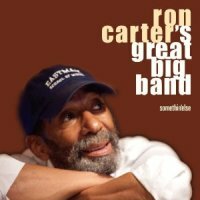 Description: When the legendary bassist Ron Carter decided to record his first-ever big band album, he turned to Bob Freedman, a renowned arranger and long-time collaborator. They worked together on selection of tunes and arrangements to realize Carter's concept of "a group that swings with a small combo feel and a big band sound." Thanks to the brilliant writing by Freedman, superb execution by the first-call musicians, and great recording by master engineer Jim Anderson, Carter's concept was fully realized. Instead of being buried under the overwhelming sound of a typical big band, Carter's bass and the core piano trio (with Mulgrew Miller and Lewis Nash!) can be clearly heard, and the band sounds like a tight combo but with bigger sound. Highlights abound in the wide-ranging program, from the opening "Caravan" with intricate lines to hard-swinging bebop tune "The Eternal Triangle," and from funky and soulful "Sweet Emma" to modal "Footprints." "Con Alma" impresses with an fanfare-like opening by the trombones, and "The Golden Striker" by John Lewis, which Carter had recorded with a piano trio, combines and contrasts the sound of the piano trio with that of the big band like a concerto. The sound quality of this CD is state of the art. Among the recent big band CDs, this ranks at the top with the Manhattan Jazz Orchestra's Sing Sing Sing 2010. Strongly recommended!